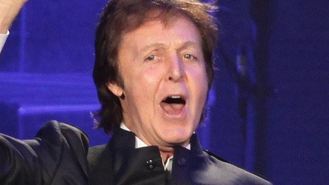 The former Beatles singer and the outspoken rapper are said to have already recorded a number of tracks, that could be featured on a new album, reported New York Post's Page Six. One song, tentatively titled P*** On My Grave, has already sparked some buzz, with Kanye's wife Kim Kardashian overheard telling friends she was a little surprised that the pair chose such a provocative name. Kanye has spoken of his admiration for the Beatles in the past, while Paul has also said he would be interested in collaborating with a rapper such as Kanye or Jay Z. The Beatles star even tweeted he had bought a copy of Yeezus and considered recruiting the Grammy-winning rapper for his song Appreciate. Speculation over the rumoured pairing was sparked after Kanye was spotted in the crowds at Paul's gig at LA's Dodger Stadium last week.